Built in 1909, Jamek Mosque, better known as Masjid Jamek among the locals is the oldest mosque in Kuala Lumpur. 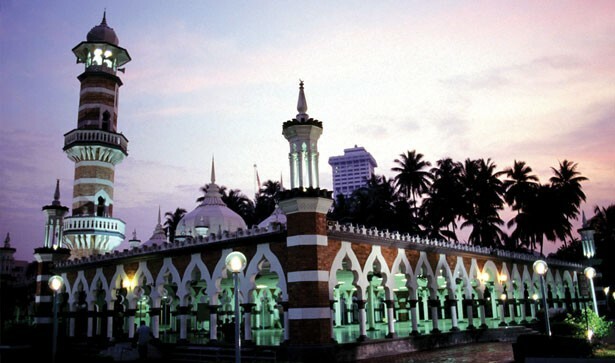 The mosque sits at the confluence of the Klang and Gombak rivers, which is also the birthplace of Kuala Lumpur. Its architecture is inspired by Mogul influences of northern India. Before the national mosque, Masjid Negara, was opened in 1965, Masjid Jamek served as Kuala Lumpur's main mosque. Designed by A.C. Norman in 1909, the mosque is unique with its traditional Moorish architecture and bears a stark resemblance to the Sultan Abdul Samad building. The mosque consists of 3 main domes which cover the main prayer hall. It is an example of the grand Islamic architecture that still dominates some of the buildings in Malaysia. The mosque compound has stood unchanged since its first inception. Candi Pendiat (Site 16) Bukit Batu Paha..